Sports franchises across North America are doing their best to top each other when it comes to outlandish menu items they serve at their home games. With the start of the NFL regular season now less than one month away, the Arizona Cardinals decided it was the perfect opportunity to reveal the newest addition to the menu for the upcoming season: The 7-pound Gridiron Burger. The newest menu item is a lot more than just a burger. 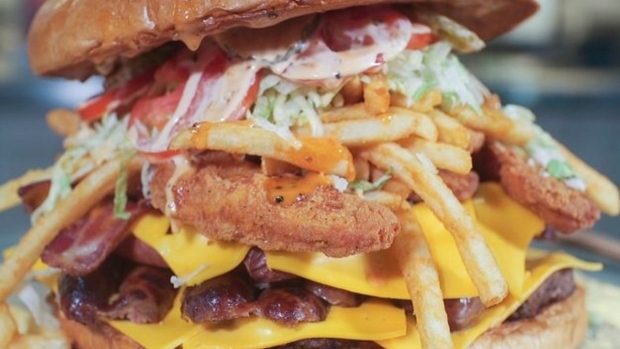 It sells for $75 USD and includes five 1/3 pound burger patties, five all beef hot dogs, five bratwursts, 20 slices of American cheese, eight slices of bacon, eight chicken tenders, 12 ounces of fries, lettuce, tomatoes, pickles and tanker sauce on a 10 inch bun. The catch, finish it all in under an hour and win a Cardinals jersey and get your picture on the video board. Other food items being added to the menu at the University of Phoenix Stadium include the Gridzilla Burger, the Dirty Fry Bird, the Taco-Dilla and the Churro Donut Sundae. It might be worth a trip to an Arizona Cardinals home game just to try all the new menu items.